That seems to be all we do but we are boat owners. The boat was neglected for about a week while I did some work for another cruiser on their travel trailer. But as soon as that was done it was right back to it. 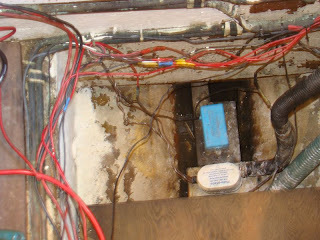 The electrical system will be an ongoing project for a long time. The battery bank is getting expanded so that has been a priority. The batteries were just sitting on a shelf when we bought the boat so a bit more secure system is needed. Building a box to hold them has been on my list for a while. It is now finished and I took the opportunity to clean up and paint a bit more of the bilge area and the adjoining engine area. Eventually the entire engine room will get a fresh coat of paint. 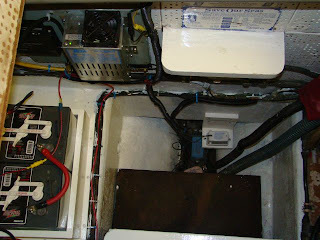 The first photo here is the area in front of the engine and where the bilge pumps are as it looked when we took possession of the boat. the second picture is the progress made so far. Not finished, but much better. The additional photos are the process of re-installing the start battery box and a new starting battery. We went from a small 24 to a heavy duty truck starting battery. The engine should like this much better. Cities, towns, counties and communities all along the Eastern Seaboard are getting on the anti- anchoring bandwagon. The reasoning for these restriction fall into several categories. First is pollution, citing sewage discharge, contaminates from bilge water, leaking fuel tanks and spills, careless disposal of trash ashore and the associated problems of abandoned vessels. Next comes damage to the seabeds and surrounding shorelines. These generally are from anchors and rode scouring the bottom, damaging seagrass and vessels breaking loose from their anchors and damaging other boats, docks, etc. A biggy is the nuisance factor and here is where pressure from landowners play a large part. Generators running on deck at night, loud music and parties, intoxication, trespassers trying to gain access to shore facilities and crime to name a few. 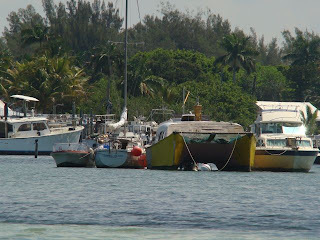 There is also the navigational hazard from boats with no anchor lights, anchored or dragging into channels and blocking access to docks and facilities. I doubt that even the staunchest opponents to anchoring restrictions can argue these points. 2009 has arrived and we look forward to what will be a new year and new beginning for us in our boating adventures. 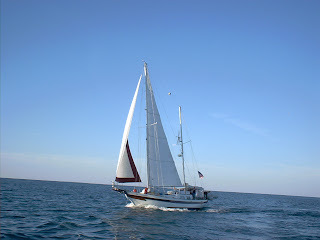 With the change over from sail to trawler we are anxious to get the boat ready and get started on a new cruising agenda. 2008 was an interesting year for us and the presidential race that lasted a lifetime was based on change so it was only fitting we made as many changes as possible. We left Houston, Texas and cruised on our sailboat and home for 17 years along the Gulf coast and East coast to Beaufort, South Carolina. A not too small move but one we are glad we made. The trip was not without some excitement that we could have really done without. For anyone interested in that trip you can find all the details and a whole lot more at our other site, http://sea-trek.blogspot.com/ with info on several of our cruises. Almost as soon as we arrived in South Carolina a buyer for our sailboat presented himself. 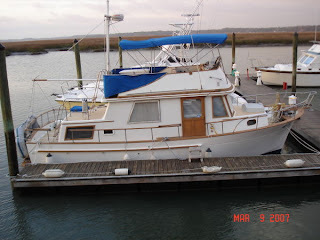 Almost immediately after we sold Sea Trek, we found our current boat also right here in South Carolina. During the selling and buying process we did a one week boat delivery that took over a month. These in and of themselves were some really big changes for us. Our plan was to head out for the Bahamas by early December on the new boat, but once again life had different plans for us. We don't get too upset about these kinds of things because they always prove to be the best for us in the long run.